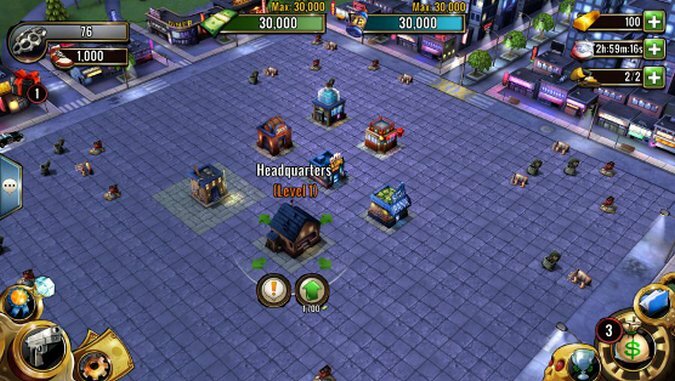 Clash of Gangs is a livelier urban version of popular mobile game Clash of Clans. The app begins with a clever loading screen: “Adjusting gun sites… Sending a text to your girlfriend… Sharpening knives… Safely wiring bombs.” This all foreshadows the experience you are about to encounter. The game begins at a construction site which initially has nothing but trash cans, construction signs and other debris. The objective is to build on the construction site and develop a team to protect your “territory.” Of course, by “team,” I mean full-on gang members. In the game, you have the option to hire thugs, gunners, wild cats and bouncers. All of these characters have different skills that serve a certain need while they are inside your territory and a different purpose once outside of it. If you haven’t guessed by now, there will be battles—lots of them. In these battles, the thugs are at the bottom of the food chain; they weaken the enemy and leave the rest for the gunners. The gunners walk around the territory, shooting until they kill all or as many of the enemy’s people as possible. The wildcats are the backup shooters; they stand in one place shooting buildings until they explode. Once they’ve destroyed a building, they move onto the next and continue this until the enemy territory is completely obliterated. The twist here is that just as you can declare war on another gang, they can declare war on yours. Throughout the game, the same territory you’ve spent so much time and money building can transform into a battlefield at any time. Similar to life in the intercity streets, Clash of Gangs is a battle for control of the city. Each gang territory has bosses, but the player is the leader of the gang. The recruitment of such bosses is the part of the game where the relationship to real-life gang culture comes into play. You have the option to hire three different types of bosses. Bosses with gold are recruits that add to your net worth, but they are the lowest form of Boss you can have. Bosses with “street cred” are second best, because they are likely to make your enemies think twice before attacking. Lastly, the option to “Hire with Boss Shard” will mean that this boss has access to drugs. To make things even more interesting, the game has three types of drugs to choose from: herbs, crystal and purple pills. Of course, these are an exact virtual replica of real-life street drugs. This game can be quite exciting as long as you have the resources to keep the game going. If you’re attacked and you lose the battle, you will no longer have the cash and gold to continue to build your businesses; this is when in-app purchases rear their ugly heads. But I must say, the purchase prompts were the only down-point I experienced while playing. Altogether, the game is composed of four missions, in which 16 battles must be won in order to begin the next mission. With a total of 64 heated street battles, great graphics and decent background music; this game is a fun time-killer. For players who enjoyed other games that depict urban street life and get a rush out of criminal activity, Clash of Gangs is perfect. The key is to keep your gold level at least 350 and never play the game without bosses; this will leave you powerless. Nichole is a freelance Entertainment Journalist who writes music, gaming and film-related articles. She has previously written for publications like FDRMX. You can follow her on Twitter @The_Tuckster.